Note: While this review will be spoiler free it will reference the previous book. If you haven’t started this series yet, check out VBC’s review of book 1, A Darker Shade of Magic. It has been four months since the events in A Darker Shade of Magic occurred where Kell and Lila saved Red London. Four months since Lila’s dream of sailing away on her ship—and how she came about said ship is in true Delilah Bard fashion. Four months since Kell saved his brother Rhy’s life by tying their lives together. Four months in which Rhy is uncertain whether or not he wanted Kell to save his life. Four months where Kell is being treated like a pariah in the royal household, looked upon more as a threat than the person who saved the kingdom and the Prince’s life. All this gets overshadowed, however, by the impending Essen Tasch—The Element Games. This year, Red London hosts the games that welcome competitors from kingdoms far away. It won’t be long before memories of the past are converging upon all of our characters. Yet somewhere even farther away, unbeknownst to our Red Londoners, something is waking up and thriving. What it wants is what it used to have: power. How it gets it is anyone’s guess. 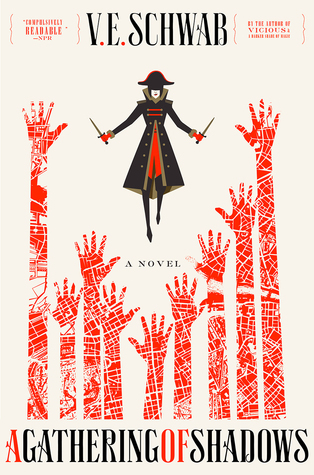 I loved that A Gathering of Shadows really opened up the world of Red London beyond the city proper. When you think on it, the other Londons would also mirror this vastness as well which, when thought on even further, is slightly creepy to think about in a place like White London. But it also brings home the point that there are threats within Red London itself that may also prove as detrimental to anything brought in from the outside. AGOS (yep we’re going with the acronym) takes a little bit longer to get going than its predecessor. I swear it’s been the longest four months in history with the amount of things that have happened to our characters in the interim. V.E. Schwab explores everything that is going on with Kell, Lila, and Rhy since that horrific night four months ago, and it’s to her aplomb that I ate it all up and would gladly take more. From the very first page, it’s clear that the story is building toward something. At first, I figured it was toward Lila returning to see Kell (inevitable in my opinion). Then I thought: building towards the games. But, no, V.E. Schwab is building toward something entirely different, and it’s with this in mind that I play the dreaded cliffhanger card. Yes, you read that correctly. What AGOS was doing was, essentially, gathering. It’s getting ready for the final chapter in the trilogy. Getting all the players in place and ready for the big showdown. For me, AGOS was more Lila’s book than any other characters’. While everyone got enough page time, I think it was Lila who grows the most as she starts to hone her inherent magical skill. Despite his misgivings about being saved, having his life returned put Rhy in a position to step up and become more of the monarch that will be expected of him when his time as King comes, and I was happy to see he did just that. And in ADSOM Kell has so much power and prestige. While I hated seeing that veneration taken from him, I think it’s essential for him to truly appreciate all he does have. I beg you, don’t be afraid of the cliffhanger. Yes, I want the next book now because of it, but don’t miss out on this wonderfully woven together story by a truly outstanding author.